A recent market research report published by Transparency Market Research (TMR) presents a detailed and professional overview of the global high density polyethylene market . The report is titled “High Density Polyethylene Market - Global Industry Analysis, Size, Share, Growth, Trends and Forecast 2015 - 2023”.The report states that the market, which had a valuation of US$56.1 bn in 2014, will expand at a moderate 4.50% CAGR between 2015 and 2023, and rise to US$84.8 bn by 2023. Volume-wise, the demand for high density polyethylene totaled 39,254.6 kilo tonnes in 2014. Over the past few years, the demand for high density polyethylene (HDPE), a major polyethylene product consumed across numerous end-use industries across the globe, has observed an upward growth trajectory owing to steady growth of the agriculture films, plastic packaging, and piping industries. Rise in the demand for rigid and flexible plastic packaging, especially in Asia Pacific, has proven to be a significant driver for the market. However, the market’s growth is expected to suffer from limitations pertaining to volatile prices of raw materials and issues in the supply chain.The report segments the global HDPE market on the basis of three criteria: product type, application, and geography. The major types of products studied in the report include blow molding HDPE, film and sheet, pipe and extrusion, injection molding, and others. Of these, the segment of blow molding accounted for the largest share in the global market, an estimated 28%, in 2014. The segment of film and sheet held the second largest share in the market, followed by the segment of pipe and extrusion in 2014. The report states that the market features a high degree of backward integration as the key producers of HDPE in the global market are engaged in upstream activities. This provides these market players with a distinct competitive advantage in terms of a steady supply of raw materials.Key application areas of HDPE studied in the report include agriculture, automotive, building and construction, and others. Of these, the demand for high density polyethylene was the highest in the packaging industry in 2014. Geography-wise, the market is segmented into Asia Pacific, North America, Europe, the Middle East and Africa, and Latin America. 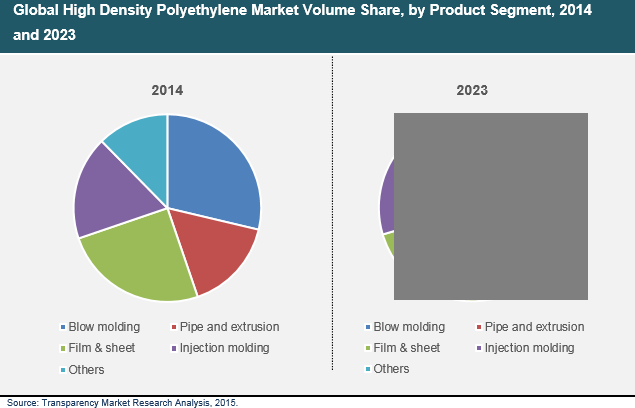 Of these, the market for high density polyethylene in Asia Pacific earned the global market its largest share of revenues in 2014. It constituted more than 40% of the global market in 2014, followed by Europe and North America. Asia Pacific is also likely to be the fastest growing regional market in terms of consumption and production over the report’s forecast period. The report also presents a detailed overview of the competitive landscape of the global HDPE market with the help of detailed business profiles of some of the key companies operating in the market, a detailed SWOT analysis of these businesses, and recent developments. Some of the key companies operating in the market are The Dow Chemical Company, Exxon Mobil Industries, Chevron Phillips Chemical Company, INEOS Olefins and Polymers, and LyondellBasell Industries N.V.